The figure is modified from Brandsdóttir et al. (2010), based on the fault inferred by Decriem et al. (2010). 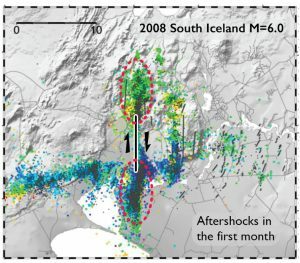 The aftershocks do indeed look like a small-scale version of contemporary seismicity surrounding the 1872 quake. The red ellipses enclose intense aftershock activity.